I think I’ve got myself a public pooer! Why can’t my baby poo when we’re at home? I never knew I would become so obsessed with poo but you would be too (maybe). I never understood why people would rush to change their baby when they had pooed… I used to leisurely change baby El after most feeds as she would just do little bits of mustardy poop all day long. The smell was quite sweet and doughy, I grew to quite like it… oh how I miss that now! One day El stopped pooping… she went a whole day without! A day is a long time in newborn baby land… The next day El exploded! Big time! I heard it from the next room and thought it was my husband because my little cherub couldn’t possibly make such ghastly noises (she can and continues to do so daily). This one big daily poo has also coincided with lots of drooling and teething which tends to make it even runnier with a strong hint of vinegar…so no matter what nappy you try, when that much liquid is shot out with such force… it’s going to escape probably 50% of the time and usually up their back. If we’re home then I’ve got the changing down to a fine art. (Involving kitchen roll up the vest before leakage begins). But we are often not home because babies are anything but convenient! I know when she’s about to blow… she pauses mid feed (breastfeeding) and goes tense, strains a little, lets rip and then continues feeding as though nothing has happened. Now I don’t want to interrupt her happily feeding but we are about to both get covered if we don’t start the military operation ASAP. She couldn’t care less and has clearly made more room so continues gulping down milk. Yesterday’s public poo was in M&S cafe…at least it was nice and busy so no one heard the explosion (I wouldn’t want to put people off their food) and El was kind enough to let me eat my cake first. So we made a hasty exit to the changing facilities (after she’d finished feeding). Obviously we were too late…up the back seepage had begun. Luckily my mummy date was on hand, she joined us with her baby in the changing facilities for moral support. Also very handy to have an extra pair of hands to hold the waving arms (sleeve straight in the poo) while I held the legs and got through a ton of wipes. Poo everywhere, a change of clothing required. On a positive note El loves getting her bum out and often finds my panicked changing methods quite amusing – at least someone’s smiling! I now live life on the edge… in wait for the next poopsplosion. Trying to carry on as normal… but when it’s been over 24 hours you can’t help fearing the next splat attack. 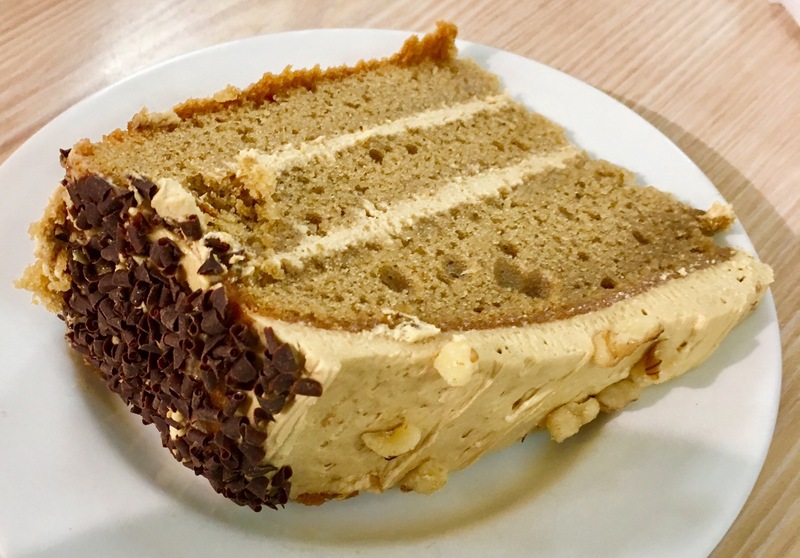 I deserved every bite of cake yesterday… thank you M&S for the yummy coffee cake and good changing facilities. Lol it sure makes a good story afterwards! I had two incidents where I had to cut my little one out of her vest because I just couldn’t get her out without poop e v e r y w h e r e. Luckily we were home those times. That’s very kind of her to do it at home 😂 we had poo in the car seat yesterday! Next Next post: Sleep Baby Sleep! Mummy on cake Blog at WordPress.com.